NASA Selects Harvard-MIT SmallSat Mission Project to Begin Concept Studies. NASA announced March 22 that it has selected 10 studies under its Planetary Science Deep Space SmallSat Studies (PSDS3) program to develop mission concepts using small satellites to investigate Venus, Earth’s moon, asteroids, Mars and the outer planets. Among the projects selected is CubeX, a CubeSat X-ray Telescope designed to map the elemental composition of bodies like Earth's moon, proposed by a Harvard-MIT consortium involving MIT collaborators Richard Binzel (EAPS) and Rebecca Masterson (Aero Astro), headed by Suzanne Romaine of the Smithsonian Astrophysical Observatory, Cambridge, MA. CubeX, which takes the form of a 12-unit CubeSat, was conceived to help understand the formation and evolutionary history of airless planetary bodies like our moon using X-ray pulsar timing for deep space navigation. "We are thrilled to have been picked to enter into the final competition for getting selected for launch," says Binzel, "With CubeX, it's a lot like flying REXIS to the moon." REXIS (REgolith X-Ray Imaging Spectrometer,) the product of a hugely successful prior collaboration between MIT and Harvard, and now aboard OSIRIS REx on its way to asteroid Bennu, was largely designed, developed, and built by students at MIT and Harvard. NASA’s Science Mission Directorate is developing a small satellite strategy, of which PSDS3 is but one example, with the goal of identifying high-priority science objectives in each discipline that can be addressed with CubeSats and SmallSats, managed for appropriate cost and risk. This multi-disciplinary approach will leverage and partner with the growing commercial sector to collaboratively drive instrument and sensor innovation. Currently Prof Binzel is the sole EAPS person on the team, but with lunar exploration firmly embedded in the department's DNA he will surely be joined by others as the project evolves. Maria Zuber's leadership of GRAIL has revolutionized our understanding of the structure and deep time history of Earth's closest planetary companion, and before that, work with Lunar Reconnaissance Orbiter (LRO) data as part of NASA's Lunar Mapping and Modeling Project. The PSDS3 awardees were recognized at the 48th Lunar and Planetary Society Conference in The Woodlands, Texas. The total value of the awards is $3.6 million. Richard P. Binzel is Professor of Planetary Sciences and Margaret MacVicar Faculty Fellow. 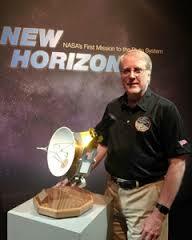 He is one of the world’s leading scientists in the study of asteroids and Pluto. As the inventor of the Torino Scale, a method for categorizing the impact hazard associated with near-Earth objects (NEOs) such as asteroids and comets, his ongoing telescopic research includes the spectral characterization of asteroids posing a potential hazard to Earth as well as those that may be most easily reachable by future robotic and human missions. His scientific analysis has shown the link between major meteorite groups and their formation and source locations. Asteroid number 2873 bears his name, an honor bestowed by the International Astronomical Union in recognition of his contributions to the field. His mapping efforts of Pluto in the 1980s revealed a diverse surface entreating for exploration, finally achieved in 2015 as a co-investigator on NASA’s New Horizons mission. He is also a co-investigator on NASA’s OSIRIS-REx asteroid sample return mission where he leads the development of the student-built flight instrument, the Regolith X-ray Imaging Spectrograph (REXIS).